It's St Patrick's Day week... so it's time for a dish inspired by the Irish. 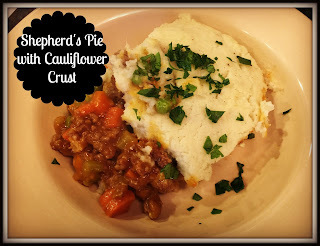 This Shepherd's Pie has all the great flavor of the traditional recipe, but made a little better for you with a cauliflower crust. Place the cauliflower in pot and cover with water. Bring to a boil and heat until the cauliflower is fork tender. While the cauliflower is cooking, brown the ground beef in a large pan over medium heat. Once all the meat is browned, remove it to a plate. In the same pan, add the olive oil and heat over medium- high heat. Add the carrots, celery, and onion and saute until softened. Add the garlic and return the meat to the pan. Add the tomato paste and flour and cook for 1-2 minutes. Add the worcestire sauce and 1 cup of the chicken stock and cook for 2-3 minutes until the sauce thickens. Add the peas and season with salt & pepper. Transfer to a baking dish. Drain the cauliflower and place in a food processor, along with 1/2 tsp salt and 1/2 tsp pepper. Puree, adding some of the reserved stock if needed. Spoon on top of the meat mixture and spread to the edges of the dish. Bake at 400 degrees for 20-25 minutes, until the crust begins to brown in spots. Serve with some freshly chopped parsley and a pint of your favorite brew!